The Danube is Europe's second longest river after the Volga and the longest river in the European Union. It originates in Germany's Black Forest as the much smaller Brigach and Breg rivers, which join at the town of Donaueschingen. From this point, it is known as the Danube, and flows eastward for a distance of 1776 miles (2857 km), passing through several Central and Eastern European capitals before emptying into the Black Sea via the Danube Delta in Romania and Ukraine. Known to history as one of the long-standing frontiers of the Roman Empire, the river flows through—or forms a part of the borders of—ten countries: Germany, Austria, Slovakia, Hungary, Croatia, Serbia, Romania, Bulgaria, Moldova, and Ukraine. In addition, the drainage basin includes parts of nine more countries: Italy, Poland, Switzerland, Czech Republic, Slovenia, Bosnia and Herzegovina, Montenegro, Republic of Macedonia, and Albania. The Danube's Basin drains 315,445.5 square miles (817,000 sq km), making it the most international river in the world. Considered Europe's lifeline, the basin is home to more than 83 million people and diverse and unique habitats supporting a multitude of species of animals and plants, some rare and endangered. Germany’s Black Forest, the Alps, and the Carpathian Mountains are a part of the Danube Basin. Not only does the Danube serve both the human and the natural world in very practical ways, it is in itself a work of art and source of inspiration. Johann Strauss composed the famous Blue Danube Waltz, while German poet Friedrich Hölderlin called the Danube "a refreshing, melodious river, sometimes foaming with high spirits, at other times dreaming serenely." 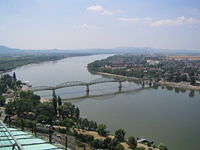 The Danube is Europe's second-longest river. It originates in the Black Forest in Germany as two smaller rivers—the Brigach and the Breg—which join at Donaueschingen, and it is from here that it is known as the Danube. It flows generally eastward for a distance of some 1776 miles (2857 km), passing through several Central and Eastern European capitals, before emptying into the Black Sea via the Danube Delta in Romania. The Danube flows through—or forms a part of the borders of—ten countries: Germany, Austria, Slovakia, Hungary, Croatia, Serbia, Bulgaria, Romania, Moldova, and Ukraine. In addition, the drainage basin includes parts of eleven more countries: Poland, Switzerland, Italy, Czech Republic, Slovenia, Bosnia and Herzegovina, Montenegro, Republic of Macedonia, Moldova, and Albania. Brigach (right) and Breg (left) forming the Danube at Donaueschingen. Upper Section: From spring to Devín Gate. 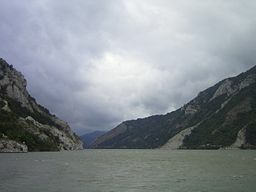 Danube remains a characteristic mountain river until Passau, with average bottom gradient 0.0012 percent, from Passau to Devín Gate the gradient lessens to 0.0006 percent. Middle Section: From Devín Gate to Iron Gate. The riverbed widens and the average bottom gradient becomes only 0.00006 percent. Lower Section: From Iron Gate to Sulina, with average gradient as little as 0.00003 percent. This drainage basin is home to 83 million people, as well as to unique habitats and important species of plant and animal life, including the endangered white pelican and beluga sturgeon. Its diverse natural habitats include the Black Forest, the Alps and Carpathian Mountains, the puszta plains of Hungary, the Bulgarian islands and the reed beds and marshes of its Delta region. More than 100 different species of fish, including five sturgeon species live within the basin, as do rare bird species. The World Wide Fund For Nature (WWF) includes the Danube Delta in its list of ecoregions, which is described as "the world’s 200 most valuable ecological regions, with exceptional levels of biodiversity, such as high species richness or endemism, or those with unusual ecological or evolutionary phenomena." The Danube Delta is the second largest delta in Europe, after the Volga Delta, and the best preserved on the continent. The greater part of the Delta lies in Romania (Tulcea county), while its northern part, on the left bank of the Chilia arm, is situated in Ukraine (Odessa Oblast). The approximate surface is 1603 square miles (4152 sq km), of which 1330.5 sq mi (3446 sq km) are in Romania. If the lagoons of Razim-Sinoe (392 sq mi [1015 sq km] of which 333 sq mi [863 sq km] water surface; situated in the south, but attached to the Danube Delta from geological and ecological perspectives, as well as being the combined territory of the World Heritage Site) are to be added, the considered area of the Danube Delta grows to 1994 sq mi (5165 sq km). The Danube Delta has been a UNESCO World Heritage Site since 1991. Its wetlands (on the Ramsar list of wetlands of international importance) support vast flocks of migratory birds, including 70 percent of the world's white pelicans and 50 percent of pygmy cormorants. Extensive regulations instituted since the beginning of the twentieth century have resulted in the loss of an extensive amount of the basin wetlands, including habitat and biodiversity. In excess of 80 percent of the length of the river is regulated, with more than 700 dams and weirs along its main tributaries. Rapid development in its northern and western watershed regions have further reduced the basin’s biodiversity, eroding lands, cutting down forests, and polluting waters. Some plant and animal species which once thrived in the area have virtually disappeared. Only in the last 30 years has conservation begun to gain priority in the basin and resources and policies have been devoted to environmental restoration. Of importance to the Danube is the International Commission for the Protection of the Danube River (ICPDR), an international organization consisting of 13 member states (Germany, Austria, Czech Republic, Slovakia, Slovenia, Hungary, Croatia, Bosnia and Herzegovina, Serbia, Bulgaria, Romania, Moldova, Ukraine) and the European Union. Established in 1998, it deals not only with the river itself, but with the whole Basin, including its tributaries and the groundwater resources. The ICPDR states its goals are to "implement the Danube River Protection Convention, promoting and coordinating sustainable and equitable water management, including conservation, improvement and rational use of waters for the benefit of the Danube River Basin countries and their people." Đerdap gorge, Serbia, overlooking Romania. 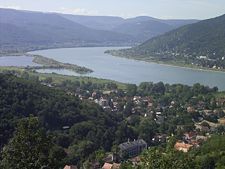 Although the headwaters of the Danube are relatively small today, geologically, the Danube is much older than the Rhine, with which its catchment area competes in today's southern Germany. This has a few interesting geological complications. Since the Rhine is the only river rising in the Alps which flows north towards the North Sea, an invisible line divides large parts of southern Germany, which is sometimes referred to as the European Watershed. However, before the last ice age in the Pleistocene, the Rhine started at the southwestern tip of the Black Forest, while the waters from the Alps that today feed the Rhine were carried east by the so-called Urdonau (original Danube). Parts of this ancient river's bed, which was much larger than today's Danube, can still be seen in (now waterless) canyons in today's landscape of the Swabian Alb. After the Upper Rhine Valley had been eroded, most waters from the Alps changed their direction and began feeding the Rhine. Today's upper Danube is but a meek reflection of the ancient one. Since the Swabian Alb is largely shaped of porous limestone, and since the Rhine's level is much lower than the Danube's, today subsurface rivers carry much water from the Danube to the Rhine. On many days in the summer, when the Danube carries little water, it completely oozes away into these underground channels at two locations in the Swabian Alp, which are referred to as the Donauversickerung (Danube Sink). Most of this water resurfaces only 12 km south at the Aachtopf, Germany's wellspring with the highest flow, an average of 8,500 liters per second, north of Lake Constance—thus feeding the Rhine. The European Water Divide thus, in fact, only applies for those waters that pass beyond this point, and only during the days of the year when the Danube carries enough water to survive the sink holes in the Donauversickerung. Since this enormous amount of underground water erodes much of its surrounding limestone, it is estimated that the Danube upper course will one day disappear entirely in favor of the Rhine, an event known as stream capturing. 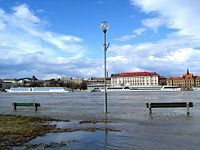 Bratislava doesn't usually experience major floods, but the Danube sometimes overflows its right bank. The Danube basin was the site of some of the earliest human cultures. The Danubian Neolithic cultures include the Linear Pottery cultures of the mid-Danube basin. The third millennium B.C.E. Vučedol culture (from the Vučedol site near Vukovar, Croatia) is famous for its ceramics. Many sites of the sixth-to-third millennium B.C.E. Vinča culture are sited along the Danube. 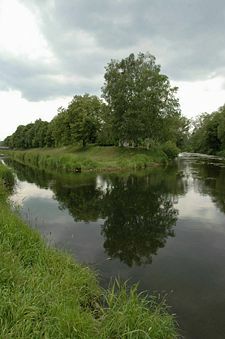 The river was part of the Roman empire's Limes Germanicus. The Romans often used the river Danube as a border for its vast empire. Today, the Danube's drainage basin is home to 83 million people, and is considered the life-blood of Europe, providing drinking water to more than 20 million people. The basin serves to unify and sustain a wealth of diverse cultures and traditions. The outstanding landscapes of the Danube's floodplains provide multiple ecosystem services, such as biodiversity conservation, water purification, pollution reduction, flood protection and support for socio-economic activities such as fisheries and tourism. Along its path, the Danube is a direct source of drinking water for about ten million people. In Baden-Württemberg, Germany, almost thirty percent of the water for the area between Stuttgart, Bad Mergentheim, Aalen, and Alb-Donau (district) comes from purified water of the Danube. 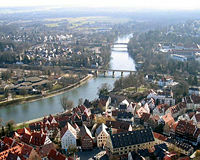 Other cities like Ulm and Passau also use water from the Danube. Another ten million people get their water primarily from groundwater through domestic wells whose source is the Danube. As "Corridor VII" of the European Union, the Danube is an important transport route. Since the opening of the Rhine–Main–Danube Canal, the river connects the Black Sea with the industrial centers of Western Europe and with the Port of Rotterdam. The waterway is designed for large scale inland vessels (110×11.45 m) but it can carry much larger vessels on most of its course. The Danube has been partly canalized in Germany (5 locks) and Austria (10 locks). Further proposals to build a number of new locks in order to improve navigation have not progressed, due in part to environmental concerns. Downstream from the Freudenau river plant's locks in Vienna, canalization of the Danube was limited to the Gabčíkovo dam and locks near Bratislava and the two double Iron Gate locks in the border stretch of the Danube between Serbia and Romania. These locks have larger dimensions (similar to the locks in the Russian Volga river, some 300 by over 30 m). Downstream of the Iron Gate, the river is free flowing all the way to the Black Sea, a distance of more than 860 kilometers. The Danube connects with the Rhine–Main–Danube Canal at Kelheim, and with the Wiener Donaukanal in Vienna. Apart from a couple of secondary navigable branches, the only major navigable rivers linked to the Danube are the Drava, Sava and Tisza. In Serbia, a canal network also connects to the river; the network, known as the Dunav-Tisa-Dunav canals, links sections downstream. The importance of fishing on the Danube, which was critical in the Middle Ages, has declined dramatically. Some fishermen are still active at certain points on the river, and the Danube Delta continues to have an important fishing industry. Important tourist and nature spots along the Danube, include the Wachau valley, the Nationalpark Donau-Auen in Austria, the Naturpark Obere Donau in Germany, Kopački rit in Croatia, Iron Gate and Danube Delta in Romania. The Danube Bike Trail (also called Danube Cycle Path or the "Donauradweg") is a bicycle trail along the Danube, winding through the following countries: Germany, Austria, Slovakia, Hungary, Croatia, Serbia, Romania, Bulgaria, and Ukraine. Part I of the path begins in the foothills of the Black Forest in Donaueschingen and continues 550 km to the scenic Passau, a town on the Germany-Austria border where three rivers meet. Part II of the path begins in Passau, Germany, near the Austrian border, and continues for 300 kilometers to Vienna. This is the most popular section. On this section, there are paved paths for all but 100 meters on either the north or south banks with bridges, ferries and some dams linking the two banks. The trail is typically traveled from west to east as it is down-hill and the winds are typically from west. The most scenic areas are on the north or "left" bank in the Wachau wine valley, a UNESCO World Heritage Site. Part III begins in Vienna and continues 330 km until Budapest. 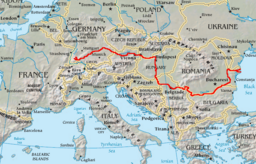 Part IV of the path begins in Budapest and continues over 1000 km to the Black Sea in Romania. 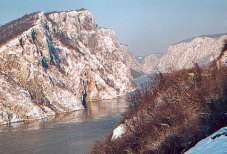 ↑ World Wide Fund For Nature, Blue River—The Danube. Retrieved May 21, 2008. ↑ UNESCO World Heritage Centre, Danube Delta. Retrieved May 21, 2008. ↑ International Commission for the Protection of the Danube River, Working for the Danube River Basin and its People. Retrieved May 21, 2008. Fermor, Patrick Leigh. 1986. Between the Woods and the Water: On Foot to Constantinople From the Hook of Holland: The Middle Danube to the Iron Gates. New York: Viking. ISBN 0670811491. Magris, Claudio. 1999. Danube: A Sentimental Journey from the Source to the Black Sea. London: Harvill Press. ISBN 1860466338. Paton, A.A. 1861. Researches on the Danube and the Adriatic; or Contributions to the Modern History of Hungary and Transylvania, Dalmatia and Croatia, Servia and Bulgaria I. Leipzig: F. A. Brockhaus. This page was last modified on 14 November 2017, at 19:19.